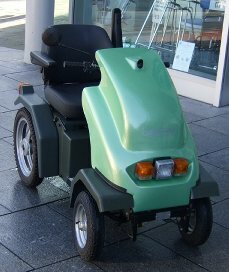 The Greater Exeter Access Project is a facility which offers access to parts of the city via our recently purchased Tramper vehicle. This service is for the use of all individuals (once registered and trained) who are suffering from mobility problems whether they are temporary or permanent. The Tramper is a great way to get around Exeter and surrounding areas - up to 30 miles can be reached depending on terrain. The furthest our Tramper has travelled so far is The Double Locks, on Exeter's canal. Following on from this the Tramper took Redhills in its stride on a trip to the Royal Oak in Nadderwater. For more accessible areas, click here.